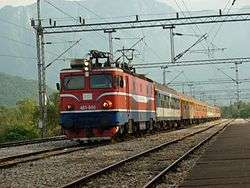 Former JŽ class 461 passing through Virpazar on the Belgrade-Bar line. 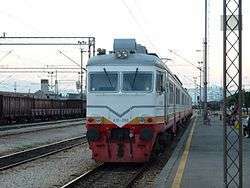 412/416 EMU of ŽPCG in new livery in Podgorica station. Željeznički prevoz Crne Gore (ŽPCG) (Cyrillic: Жељезнички превоз Црне Горе; English: Railway transport of Montenegro) is a joint-stock company that handles passenger transport within Montenegro, as well as operation of the Montenegrin rolling stock. CAF Civity class 6111 EMU at Bar station. 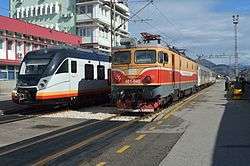 New CAF Civity next to passenger train hauled by older former JŽ class 461. 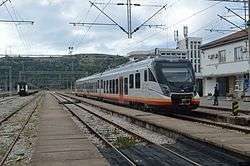 Three CAF Civity EMUs have been ordered by Railways of Montenegro specifically to serve the Podgorica-Nikšić railway, cutting travel time to only 50 minutes. The first of the new trains started with service on July 13, 2013. ↑ ZCG Prevoz - Novosti - U julu 2013. godine, isporuka 3 nova EMV-a Retrieved November 2011.